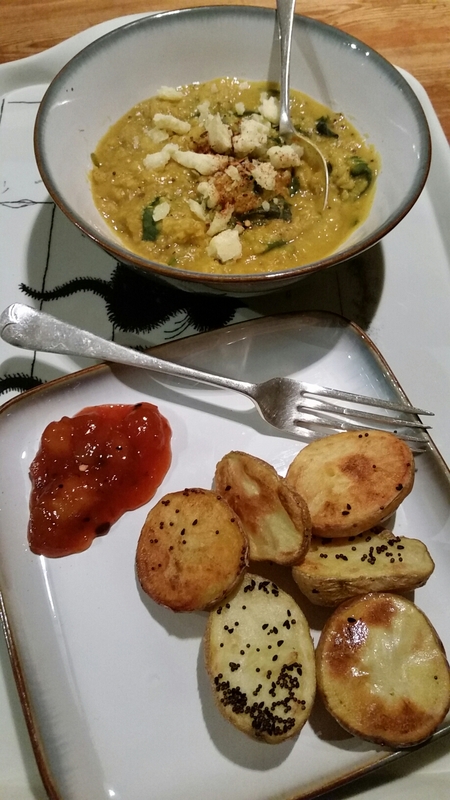 Another vegetable curry – this one Dahl-based. The previous one was pretty darn good if you want to check it out! I have done many variations on this recipe over the years, very much depending on what vegetables I happen to have; also on whether I’m making it as a side-dish which I do quite mild, or a meal in itself which I like somewhat spicier. This time I used carrots, plus spinach and the crumbly cheese which I needed to use up and had also put in my pasta yesterday – very versatile! Fry the onion, garlic, carrots and spices in oil. When the onion is becoming transparent, add the lentils and stock. Allow to simmer for about half an hour, adding more water if it begins to dry out. Taste, and add chilli salt as required. Stir in the spinach. When the spinach has wilted serve with a generous sprinkle of crumbled cheese. … and it was even better the next day with potatoes roasted in coconut butter with mustard seeds and black onion seeds :). I don’t think that this recipe needs much introduction. I love chilli, whether meat or vegetable chilli, and I usually make it up as I go along; this is the first time that I have put enough thought into it to be able to write it down. Fry the onion, garlic, chilli and a couple of grinds of black pepper in some oil for a couple of minutes. Add the pepper and fry for another couple of minutes. Add the chickpeas, kidney beans, tinned tomatoes, tomato puree and chocolate. Mix well, turn down the heat and cover with a lid. Cook for about 20 minutes stirring occasionally. If it starts to look a bit dry add a splash of hot water from the kettle. Taste, add the chilli salt until it suits your taste. Serve with wraps and/ or rice, avacado, creme fraiche and cheese. This is part of my ‘Supermarket-free Lent‘ and also includes some Christmas leftovers. I love Turkey Pie; it is usually a Boxing-day meal in my family so it is quite a treat to have it in March. If I had had some I would also have added bacon or leftover gammon to the pie-filling; however seeing as I had defrosted the gammon in error a couple of weeks ago and ended up making a slightly unusual curry with it I had to make do! This served three people with leftovers. This is an Allcock-family cheat; put the pastry ingredients into a food processor and whizz until combined, adding more water if necessary a splash at a time. You will find that after a minute or so the pastry comes together in a nice ball ready to roll out. In a saucepan gently cook the onion and mustard seeds in the butter. Add the milk and heat slowly. Put a heaped tablespoon of cornflour into a jug with enough cold milk to make a paste. Once you have a good paste add the warm milk and mix well, then return the mixture to the saucepan. Continue to cook gently, stirring frequently until thickened. Next, arrange the turkey in the base of an ovenproof dish. Cook the leeks in a small amount of water for about 3 minutes and then add to the dish. Cover with the white sauce and leave to cool (otherwise the pastry will shrink). Roll out the pastry on a floured surface to approximately 1/4 inch thick. Put the dish with the filling next to the pastry and gently lift the pastry onto it by folding it back over the rolling pin. When the pastry is loosely covering the filling, take a fork and push the pastry against the side of the dish all the way round. Then, either take a knife and trim the excess pastry off, or fold the edges back in on themselves for a more ‘rustic’ look (I tend to do this when the pastry is difficult to deal with and it looks a bit scruffy – pretend that it’s meant to be that way!). Pierce the pastry a couple of times with a fork and brush with egg. Grind some salt over the top. Bake in the centre of the oven for approximately 1/2 hour, until the pastry is golden. Any extra pastry can be used to decorate the pie or, if there is enough, to make jam tarts. Both the baking and the writing of this post are a combined effort between myself and my 10-year old neighbour; we both wanted to make little cakes for our mothers and thought that it would be a good opportunity to share our favourite basic little-cake recipe with you and to do a couple of rather different variations on a theme. My neighbours and I spend many a happy hour watching Dr Who together so using the Dalek ‘cupcake wraps’ which I had purchased a little while ago (sadly discontinued) and had put away for a ‘rainy day’ was an obvious choice; it was decided that they would be chocolate-orange Daleks so the mixture included chocolate orange chips and they were topped with orange buttercream. My mother cannot stand buttercream (far too sweet) so I topped the little cakes with lemon icing and decorated them with stars (because she is a star!). We look forward to hearing what weird and wonderful creations you make using this basic recipe – please send us a photo! Makes approximately 24 cakes. You will see from the above picture that we used butter because I ran out of margarine; I wouldn’t recommend this because it makes the mixture a lot more dense. The observant amongst you will also notice that the photograph includes baking powder but that there is none listed below; this is because I am stupid and went on a wild-goose chase around Stroud before our baking session looking for the stuff (surprisingly hard to find the day before Mother’s day) only to remember when I got home that I didn’t need it. grrr. For half of the cakes we added chopped chocolate – dark chocolate with orange. The dark chocolate works well because the icing is so sweet. We used this recipe for the piped icing with a couple of minor changes; we only used half the amount of the vanilla essence and we added zest from the orange. We used yellow, red and blue food colouring for the Daleks. Icing sugar and lemon juice. For the basic sponge mixture, put all of the ingredients into a bowl and combine with an electric whisk until very smooth. Transfer half of the mixture to another bowl and add the chopped chocolate. Divide the mixture between paper cases – about a heaped tablespoon in each – and bake in the centre of the oven for about 15 minutes. Cool on a wire rack. For the butter icing follow the recipe in this link, but use less vanilla and add some orange zest (it’s rather too sweet otherwise). Take a quarter of the mixture put into a piping bag then, starting at the outer edge of the cake, gently squeeze the bag and spiral towards the middle. Transfer another quarter of the icing into a separate bowl and mix in yellow food colouring a drop at a time. When you have got a shade of yellow that you are happy with add the icing to the piping bag; you will need to ice a ‘reject’ cake to push the remainder of the plain icing through, then you can ice your yellow Dalek! Repeat this with the red food colouring. Finally, add blue food colouring to the remainder of the icing. It is important that you use a fresh piping bag for the blue because it doesn’t mix well with red and yellow! For lemon icing, put approximately 6 heaped tablespoons of icing sugar into a bowl and juice a lemon (you can also use bottled lemon juice). Add the lemon juice to the icing sugar a dash at a time until you get a smooth, stiff consistency. Spoon onto the cakes and spread with the back of a knife.